Anything and everything about Benecure. Benecure won the PACT Healthcare App Challenge competition ! Benecure competed in the PACT (Greater Philadelphia Alliance for Capital and Technologies) Healthcare App Challenge against an international cohort of competitors with companies from as far as Germany and VC backed finalists. The competition was sponsored by Independence Blue Cross. We created a patient management portal from scratch, to help case managers deal with a large number of patients efficiently, we also created a patient facing app that connects with smart devices to help patients proactively manage their chronic condition. Benecure has expanded to manage diabetes apart from the current cardiovascular diseases we already manage. 80% of Diabetics will eventually die from coronary heart diseases and it made sense for us to include this disease for our users. At the PACT competition, Benecure won first prize which includes $30,000 in cash, in addition to meetings with investors, experienced entrepreneurs and direct access with Independence Blue Cross. Benecure also won the Validic API Award, for a startup that can have a large impact by using their services, this prize included $5,000 in Validic API credit. Benecure was highlighted by MEDCITY News for "Customization: Why healthcare brands should get personal" The article talks about the need for personalization when it comes to healthcare and how Benecure takes wearables a step further by providing actionable insight through the data collected. We were also profiled by them. Benecure has been accepted in to MATTER. Benecure is honored to announce that we have been accepted into MATTER, a health tech startup incubator that is opening in Chicago, IL. Our acceptance puts us on par with the best health care startups in the Midwest. MATTER is a supportive space that offers mentorship, networking, and shared resources to promising health care focus startups. At MATTER we are able to be plugged in a community of mentors, partners, investors, developers, customers, designers, coders, and entrepreneurs who learn from each other, encourage each other, and share the startup journey. We hope to use these experiences to continue to grow and develop. Benecure was selected to present at the HealthXL Global Gathering event in Dublin, Ireland ! HealthXL has selected Benecure as one of the top healthcare start-up companies to look out for. We were selected on the basis of having the most potential to drive change in healthcare. The eight other companies in contention were Alivecor (USA), Equicare Health (Canada), MediSafe (Israel), Promeditec (Italy), Benecure (USA), Zephyr Health (USA), Apervita (USA) and Sentrian (USA). We have been given the amazing opportunity to travel to Dublin and present in front of several influential members of the international health care community and venture capitalists. More exciting news will be on the way, stay tuned! HealthXL, the global clearinghouse for innovation, has community members from major global health enterprises. HealthXL partners include IBM, Novartis, Bupa, Cleveland Clinic, Becton Dickinson, ICON, ResMed, Janssen Healthcare Innovation, Linde Healthcare, Partners Health Care, Silicon Valley Bank, and Ernst & Young. Benecure placed second at the American Heart Association Health Tech Competition. As part of the competition we were given a beautiful booth. Benecure was selected to compete in the American Heart Association Health Tech Competition at the Scientific Sessions. The Scientific Sessions is an annual conference for cardiovascular professionals and is attended by 15-17,000 cardiologists from a 100 different countries. We were selected to compete in the competition because the AHA views as one of the innovative startups in the cardiovascular space. Tie breaker voting for audience favorite. We faced tough competition, all of the other teams had a presence in California and had venture funding ranging from $800K to $6 million, yet we were still able to give them a run for their money. Initially, we tied for first place for audience favorite with Eko Devices. After a tie breaker we were given the second place spot for audience favorite despite being the most underfunded startup in the competition. We are proud to have represented the Chicago Health start-up community. Our ability to compete with more established companies was noted. Several professionals and executives reached out to us and looking to help Benecure achieve the next milestone. We are gathering momentum, stay tuned for more updates. Benecure has launched its first pilot with one of the largest non profit health systems in the US. The pilot is being conducted in four states by experienced testers. These testers will give a detailed user report on the usability and effectiveness of the Benecure service. We are excited for this opportunity to improve our service and continue to provide our customers with an ever improving product. We have several more pilot programs in the pipeline. Expect more updates in the near future! Some of the devices for our testers. Benecure is a portfolio company at Healthbox ! Part of the Benecure Tech team working hard at the Healthbox offices. We are excited to announce that Benecure has been selected for the Healthbox Chicago 2014 program ! As part of the program, we will be mentored by healthcare industry veterans and have access to a rockstar team of supporters including HCSC (Health Care Service Corporation) and five leading hospitals and health systems—Advocate Health Care, Ascension, Community Health Network, Edward-Elmhurst Healthcare and Ridgeview Medical Center. Press release can be seen at link. We were featured in Forbes ! As we mentioned in our earlier post, Benecure was interviewed by TechStars Chicago and we along with other finalists in the program were given access to FounderSensei. FounderSensei is a mentor driven accelerator that helps startups follow the lean startup methodology. The program is headed by serial entrepreneur Dave Lindhardt. Even though we had made progress in our respective businesses, all the startups improved dramatically through the program. In Benecure’s case we were forced to interview more people and challenge assumptions. Pictured here are the founders of Hippoteq, Savvo, FounderSensei, Peckish and Benecure. At Demo-day, we garnered great feedback along with leads to large corporations that would use our services. We also received interest from several investors. If you would like to know more about the program, feel free to reach out to us. Benecure was selected as one of the top 10 healthcare startups in the Midwest and was given the opportunity to present at the Health Tech Summit which is one of many Health 2.0 events that happened across Chicago. Jason/Muhammed presented the startup and met some amazing founders along with inquisitive audience members. Benecure is part of the prestigious NCIIA advanced E-team grant and is a grant holder for 2012-2014. When Benecure was invited to attend the NCIIA workshop in Boston, we had no idea how eventful of a weekend it would turn out to be. The Monday before we were set to leave, the Boston Marathon tragedy occurred. While we were all shocked and saddened by the events that unfolded, we were determined to not allow this to interrupt our daily lives. The event was still planned to happen so we loaded up for our early morning flight on Thursday. Unfortunately, Chicago’s weather was not going to be cooperative. In one of the heaviest rainstorms on record that saw massive river flooding, Muhammed and Jason braved the forces of nature to reach the airport. Incredibly, the flight was not canceled and was only delayed as they waited for all the crew members to show up. Our other teammate, Tanim, who was set to fly out later that night, was not so lucky as his flight would end up being canceled. Around the same time we were learning of this, the MIT shooting took place. This would lead to the first day of the workshop being canceled, due to the lockdown of Boston. Still, the team braved the streets of Boston in search of sustenance and was lucky to find an open restaurant, full of Boston’s finest no less, to look after us (who as you can tell, seemed happy to see us). The workshop resumed on schedule the next day. It was a great learning experience, as it reaffirmed our team goals and helped us to focus our strategy in a more concise fashion. Working in collaboration with the other 8 startups in attendance, under the guidance of our great coaches, we were in a fantastic environment to think and grow with our fellow startups. We were happy that we had come to Boston and overall, it proved to be a trip that we would not forget anytime soon. Jason and Muhammed at MIT with the Boston skyline in the background. TECHSTARS NYC & Chicago interviews/selection. TechStars is an incubator program that is touted as #1 in the world. They have a lower acceptance rate than Harvard. The program focuses on digital startups but Benecure was lucky enough to be considered for contention/acceptance. The auditorium at New York University that hosted the event. We had applied for the NYC program and were selected as one of the top early applicants and invited to “TechStars for a day”. We spent the day interacting with alums, mentors and learning more about the program. It was interesting to see the diverse pool of applicants. There were teams from as far as Europe and South America that had flown in for the event. We were interviewed by TechStars NYC a few weeks later via Skype. (At the time I was meeting hospitals/investors in Asia) Unfortunately, we didn’t make it since some of our team members were still enroute to graduation at the time. 1871 office space where TechStars Chicago is based. In 2013, Excelerate, a incubator program in Chicago, announced it was converting to TechStars Chicago. Just as in NYC, we made the cut and were interviewed. This time around, we were ready and got some amazing feedback, including introductions to a fantastic mentor who has worked in an industry similar to us. Even with the great feedback, I knew we were always a long shot for the program due to our hardware/healthcare setup and their preference for digital startups. Overall, it was an interesting experience being vetted with firms that have revenues in the 6 figures and I would highly encourage other folks who are on the fence to consider the program. In June 2012, we were selected to present in Chicago TechWeek. TechWeek brought together the best startups in the Chicagoland area to showcase their work. With no real budget to speak of, we knew from the get go that the deck was stacked against us.The best presenting team would win $50k which is a sweetener to any deal. We accepted the invitation and headed out to Merchandise Mart. MAHYAR AND TANIM PRESENTING AT CHICAGO TECHWEEK. EVEN WITH A SHOESTRING BUDGET WE STILL MANAGED TO PULL A CROWD. In a quick team meeting we set our priorities for the event. Get the word out of a change coming to healthcare delivery. With a severely limited budget, we had to be creative. 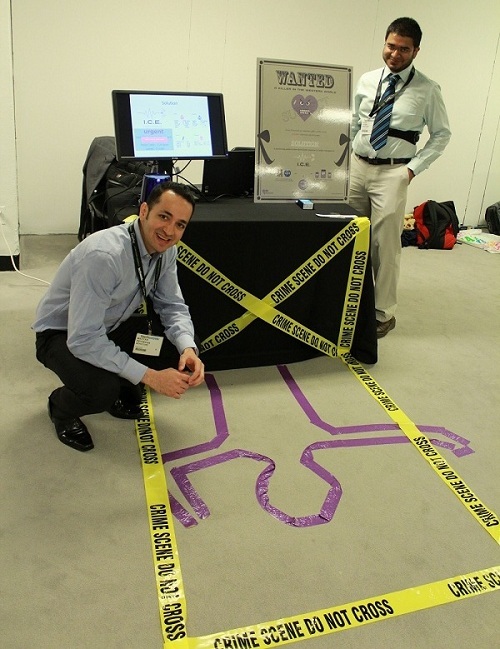 Muhammed came up with the idea of using a crime scene to grab people's attention and to highlight the plight of heart attack victims. It brought attention to heart attacks being the number one killer in Chicago, a fact that was not well known. During the event, we realized just how big of an underdog we were. We were shocked at the amount of resources spent at some of the booths. One booth in particular had hired beautiful models and dressed them up with wings and another had LCDs covering every inch of their booth. But even though we were out matched by budget, but judging from the amount of people who stopped by our booth, they knew we had a big idea. We were eventually judged; oddly even though we were the second stand from the entrance, we were one of the last teams to be evaluated and our judges looked like they were done for the day. We did our presentation and it went great...kind of. In the middle of the presentation, a female heart attack survivor asked for a high five as she cast her ballot to vote for us. This probably didn't amuse the judges who were confused as to why I was giving a high five in the middle of a judging round. Our fan was ecstatic for a reason; some female heart attack survivors have a 1 in 2 chance of dying within a year of their initial cardiac event. Developing a platform to prevent that is definitely high five worthy. We didn't end up winning, but that didn't damper our spirits of an otherwise exciting and successful day. We set a number of goals for the event and one of which was to get the word out about Benecure, which was a success. Hundreds of people stopped by our booth and were very excited with what we had to offer. We even met a couple insurance representatives who wanted us to pitch to their investor arm. Overall, it was a very good experience and we were glad we accepted the invitation. A TEDx talk to remember. We were invited to talk at TEDx IIT (Illinois Institute of Technology). Muhammed was asked to present about his experience with startups. Since we didn't want to disclose the patent-able parts of our startup, we decided to only briefly discuss the ramifications of Benecure's work. (In this video we refer to it as ICE, which is the planned name of our first product). Muhammed left the other startup, Tabule to focus on Benecure.